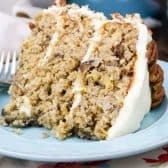 Hummingbird cake is a perfect marriage of fruit, tropical flavors and nuts. It’s light and delectable, with a fantastic cream cheese icing! In a large mixing bowl, whisk together the first 6 ingredients. Add the bananas, oil, pineapple, eggs, vanilla and pecans and stir just until the dry ingredients are moistened. Pour batter into prepared pans. Bake in preheated oven for 28-30 minutes or until a toothpick inserted into the center of the cake comes out clean. Cool in pans for 10 minutes. Turn cakes out onto wire rack and cool completely, about 1 hour. In a medium mixing bowl , using an electric mixer, beat together cream cheese and butter until smooth. Gradually add powdered sugar, beating on low speed, until combined. Add vanilla and stir to combine. Place the first layer of cake on a serving plate. Evenly spread one forth of the frosting over top. Repeat with remaining layers. Spread the remaining frosting over the sides of the cake.